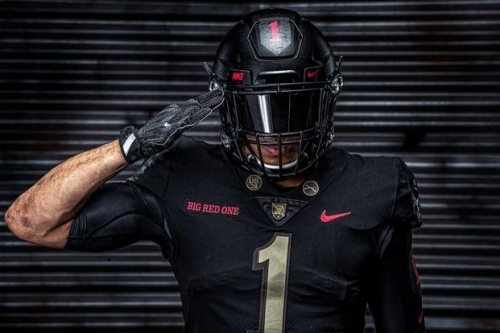 Army will honor the "Big Red One" on the 100th anniversary of the end of World War I with the uniforms the football team will wear during this year's Army-Navy Game. West Point officials worked with Nike to design the uniforms to honor the Army's first division. Army leaders famously formed the 1st Expeditionary Division, later named the 1st Infantry Division, after President Woodrow Wilson promised the allies he would send a "division" to France. Nike and Under Armour designers have created unique jerseys for the Army-Navy game since 2004, with the unveiling of the designs becoming part of the week leading up to the game. Navy's uniforms will prominently feature their mascot, Bill the Goat. U.S. Military Academy officials have chosen to honor the history of different divisions with their uniform designs, starting in 2016 when the team honored the 82nd Airborne Division. This was also the year Army broke its previous 14-game losing streak. Last year, Army wore all white uniforms honoring the Pando Commandos of the 10th Mountain Division, soldiers who fought the Nazis in the Italian Alps. It snowed during last year's game, and the uniforms acted as camouflage as Army won 21-17. This year's design features an all-black uniform with a prominent red "1" numeral on the helmet's crown, mimicking the helmets worn by 1st Expeditionary Division soldiers in battle. The Big Red One notably won the first major American victory in WWI at the Battle of Cantigny. Soldiers in the Big Red One's 28th Infantry Regiment earned the nickname, the "Black Lions of Cantigny," during the battle by defeating the Germans in 45 minutes after their initial attack. The team's uniforms will honor these soldiers with black lions on the players' shoulders. Bronze emblems on the collars of the jerseys will honor the Big Red One's 28th, 26th, 18th and 16th Infantry Regiments; 7th and 5th Field Artillery Regiments; and 1st Engineer Regiment. The bronze emblems mimic the ones worn by enlisted soldiers in battle. The back of Army's helmets will feature a WW1-era flag featuring 48 stars, since Hawaii and Alaska had yet to become states at that time. When the West Point Black Knights run onto their home field at Michie Stadium, every player makes sure to touch a bronze plaque with the famous quote: "I want an officer for a secret and dangerous mission. I want a West Point football player." George C. Marshall's quote became famous during World War II when he served as the General of the Army. Well before he became one of the few U.S. military officers to earn a fifth star, he served as the 1st Division's operations officer during the Battle of Cantigny. Army and Navy will play at Philadelphia's Lincoln Financial Field in the 119th meeting between the two service academies. To learn more about the history behind Army's jersey and to buy a helmet, you can visit Nike's website.